On any given year the market has chapters and plot lines as thick as any melodramatic soap opera. Less we forget, emotions are the heartstrings that drive these seemingly random and whimsical dances. However, upon reflection, 2011 was anything but your typical daytime drama. Considering the tumult that most market participants have navigated in the past decade - that speaks for itself. Non-linear, layered risk motifs. Causation - squared to the power of correlation. Fat fluffy tails. 2011 had them all. In reflection, what started off as a continuation of the momentum frenzy that began in March of 2009, culminated and burned to the ground on one Sunday evening in early May. Thankfully, and on the backs of our best and brightest soldiers - Bin Laden was dead. But a key ingredient in the market's risk appetite recipe was also killed with the same bullet. Coincidence? Yes and no. As with most things, causation is typically a fools game and likely best kept within the academic confines that have the power of persuasion to suspend the typical laws of nature and reason us mortals have to deal with on a daily basis. Certainly, Bin Laden's death - or more importantly, life before - was not the motivation for silver's historic rise. But as with all parabolic and momentum moves - a certain external catalyst is required to rupture the fairy tale thesis once and for all. Bin Laden's death provided that prick. I was asked repeatedly throughout the year how I maintained the level of confidence I carried with my respective positions this year. Simply put - I trusted through my research early in the spring that the silver market was headed towards the exit ramp (see Here). This was confirmed in May and subsequently with every failed bounce attempt since. In essence, by getting silver right - you had an insight into the markets hidden tail risks (see Here & Here), the pulse of the momentum trade (see Here), a canary into the commodity market (see Here) and a confirming tell on the currency market (see Here). As many of you are aware of, I look at analog comparisons through a variety of prisms - depending on the market environment. 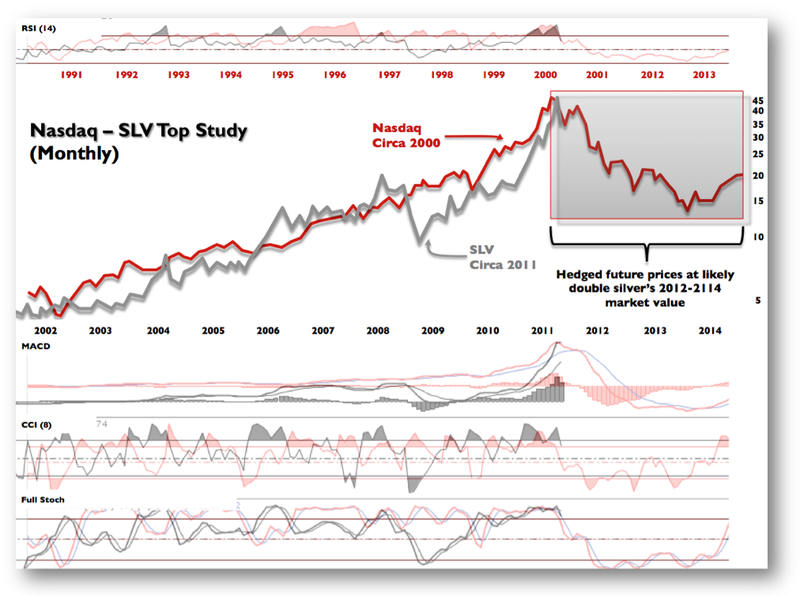 With silver, I primarily used the Nasdaq Bubble from 2000 (see Here & Here) as a longer term analog for what transpires when a secular bull market fails after a parabolic top; and the 2008 price structure for silver (see Here) as the closest parallel for determining short term trade objectives, proportions and pivots. By doing so, I didn't just get silver right in May - I had its calendar price trajectory since May. May 15th - "Carlos Slim"
This helped me determine where and when the respective risk appetites would ebb and flow throughout the year in the equity, currency and commodity markets. To make a long story short , so went silver - so went everything else. A seemingly small and nuanced market was the tell for being on the right side of the tracks in 2011. 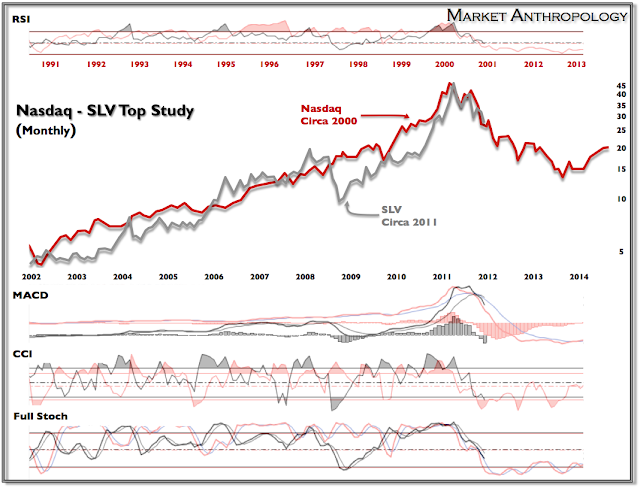 Going into 2012, I suspect silver will remain an important market to watch and reference - especially in the near term. But further down the road, it will no longer be the canary it once served as. That bird has died. We will have to rely upon other markers to help guide the way. Upon reflection, Pulp Fiction seems a more appropriate comparison than a soap opera for 2011- and I don't believe we have been introduced to those less than becoming gallows characters in the back half of the story. Don't be fooled by the year-end performance dance that took the SPX out on literally a flat note for the year yesterday. The comic irony being the equity markets have been out of tune with the Treasury, commodity and currency markets since October. As witnessed throughout 2011 - and highlighted once again in December, volatility and weakness in the precious metals markets has presaged volatility and weakness in the equity markets. Threading the performance needle was a nice touch in keeping the impressionable impressed - as well as completing another trip across the 1255 hinge line on the SPX that I mentioned in my previous notes. I believe over the coming weeks the equity markets will embark upon the second leg of the swan dive that began in August. 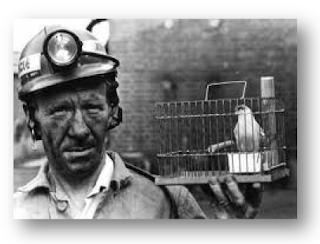 With that said - have a happy and healthy New Year and get ready to meet the frost the markets will surely bring in 2012.